Performing regular maintenance on your storage tank water heater can increase the useful life and efficiency of a water heater. The high operating temperature of water heaters encourages the precipitation of calcium carbonate, which settles and builds in the bottom of the tank. In gas-heated tanks, this sediment creates a barrier between the gas burner and the water, which results in longer heating times and lower fuel efficiency. Sometimes the bottom of the tank will overheat, weakening the tank steel and glass lining and reducing the life of the tank. In electric water heaters, the sediment layer can affect the performance of the lower heating element and/or causing it to burn out. This requires the upper element to heat the full tank of water, wasting energy, money, and reduces the amount of hot water. The good news is that if you are comfortable with the process you can perform the systematic maintenance yourself. Below are the steps to maintaining your water heater. 1. Drain and flush your water heater. Turn the gas valve, at the bottom of the tank, to the pilot position and let the water cool down. Close the incoming water valve and attach a (garden) hose to the drain valve, located at the bottom of the tank, to drain the water outdoors. Open the drain valve and turn on one hot water faucet somewhere in the house to let in air. When all the water has drained turn the cold water valve on and off until the water from the drain runs clear. Close the drain valve and the hot water faucet, open the cold water valve, and fill the tank up completely. 2. 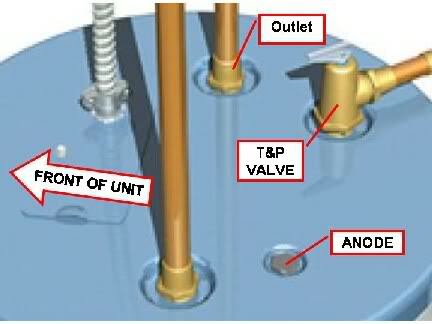 Verify the pop-off valve functions, i.e. it opens and closes and does not leak while the valve is in the closed position. This is also a good means of bleeding the air from inside the tank after refilling it. 3. WHILE THE TANK IS EMPTY Check the condition of the sacrificial anode and replace it if necessary. 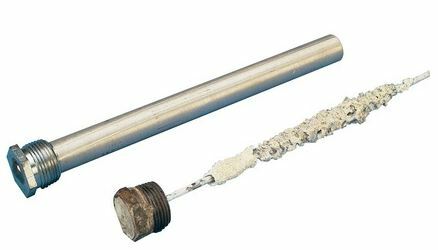 The sacrificial anode is a metal rod made of a metal that will react to corrosive properties in the water quicker than the other various metal parts of the water heater. This helps to prevent the other metal parts of the tank from corroding and destroying your water heater. If you have hard water, the anode should be replaced (or at least checked for replacement) once every 2 to 3 years. Be sure to check your owner’s manual for instructions on the how, what and when for your particular tank’s maintenance. 4. Turn the gas valve back on to the desired temperature. Turn off the electrical power to the water heater and let the water cool down. 2. Verify the pop-off valve functions, i.e. it opens and closes and does not leak while the unit is turned off. This is also a good means of bleeding the air from inside the tank after refilling it. 3. WHILE THE TANK IS EMPTY, check the condition of the sacrificial anode and replace it if necessary. 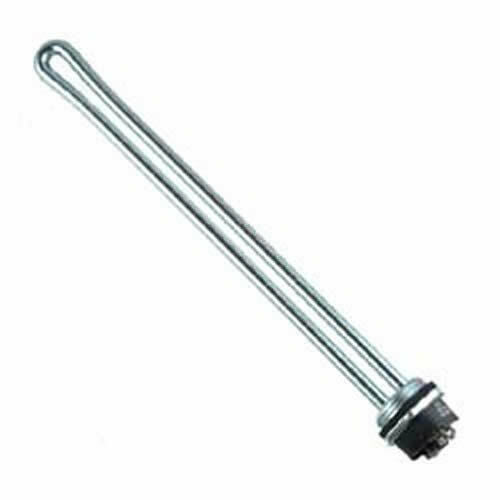 The sacrificial anode is a metal rod made of a metal that will react to corrosive properties in the water quicker than the other various metal parts of the water heater. This helps to prevent the other metal parts of the tank from corroding and destroying your water heater. If you have hard water, the anode should be replaced (or at least checked for replacement) once every 2 to 3 years. Be sure to check your owner’s manual for instructions on the how, what and when for your particular tank’s maintenance. 4. WHILE THE TANK IS EMPTY, check the condition of the heating elements and replace if necessary. The heating elements can burn out or corrode over time. 5. Turn the electricity back on to the water heater. If you maintain your water heaters on a regular basis, you should get about 15 -20 years life from your water heater. Plumbing supply houses and some big box stores carry heating elements and sacrificial anodes for minimal costs. As the weather warms up, take advantage of the last of the cooler [attic] days and perform that maintenance on your water heater(s) soon! For any additional questions on water heater maintenance, please email us at [email protected].